In the back of my mind I have very passively been making two very big assumptions about my world. 1) That’ there will one day be a L’Arche community in Austin Texas for me to one day be a part of and 2) That Dianne would probably be the very first assistant at that community and that, like me, she would finally find her true home at L’Arche as well. Dianne was also, without question, the biggest fan of the Outpatient Monk blog and this will probably be the first post since I started writing that wont be read by her letter for letter. Dianne died tragically yesterday and this blog, this world, and my future will always be the lesser for her absence. I am scattering her virtual ashes here at this place online to which I knew she loved to come. She was indeed a misfit, a lousy joiner and a homesick soul. The best way I can think to honor her would be to listen to her life honestly and pass on her light here so that her death would not be the end of her grace and love on this planet. Dianne knew in her life, more of violence and betrayal than any one personal should ever know. I only knew her story in small parts as she shared them with me but I always found myself leaving her presence and our conversations feeling a little as if I had been in the presence of a strange hero who was at once a rare bird, a powerful tigress and a gentle lamb. Some people who know violence too well often learn to rely on violence to keep themselves together. Dianne spent her life trying to forge herself an armor made out of a fierce tenderness. It didn’t always keep her together perfectly and she struggled sometimes to find her edges, but her commitment to tenderness made her a woman that one could only describe as magical with children and especially children with disabilities. In my mind she shared a spirit of St Francis and sometimes I would picture cardinals landing on her shoulders while we talked. She was a portal of grace and she sparkled when she spoke of her children and grandchildren. She gave of herself, sometimes too much, and we didn’t always know where to put her generosity. And in this age of fear and scarcity, she was right to err on the side of giving too much. That part she got right. Because she was no stranger to darkness she seemed to be able to see inside other people and all too easily spot their darkness as well, but she did so with compassion, not fear. Even so she tried to live as if all she could see was the brightness of God in people. That is the life she tried to lead. In this way she is an example to us all. One day out of the blue, in a time in which I was just finding my own footing with a new and delicate sense of vocation she just dropped by my house with a spontaneous gift. 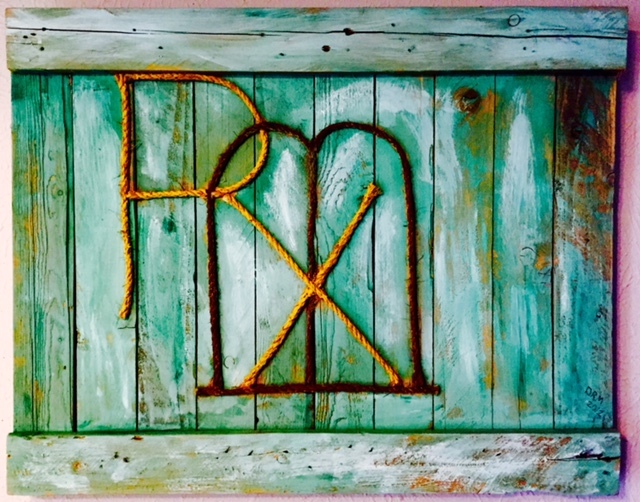 She had fashioned the most beautiful Outpatient Monk logo made from reclaimed wood and rope that was at once weathered and rustic as well as bright and beautiful..
That was Dianne: creative, reclaimed, weathered, rustic, bright and full of color. What I wouldn’t give now to go back to last Wednesday and say the same to her. I can see you are broken too. It might just be the secret to your magic, especially when you offer it to God. Keep going keep sharing, keep loving, and keep being exactly who you are. 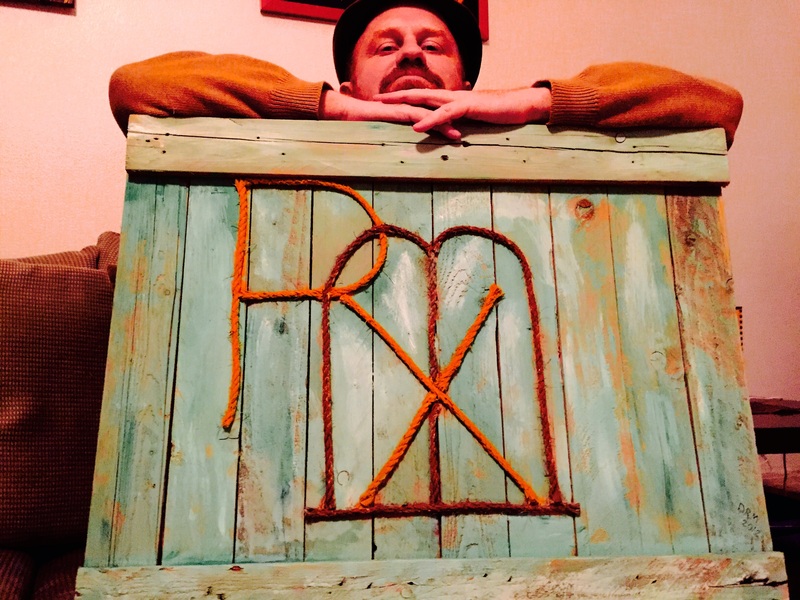 Let’s go on, weathered, rustic, colorful and made of found objects and born of love. Wow, Doug. Thank you for sharing. May your heart be comforted in your mourning. Love you. Beautiful, Doug. Thanks for posting in the midst of all that you’re facing. Thank you for sharing. I feel a kinship with your friend…like I knew and loved her too. Bless you. Saddened or your loss and what seems clearly to have been a loss for the world. May the grace in which she sought to live now be more free to flow unhindered by flesh, and may the tender bird find rest from her weary travels. Thank you so much for writing this. It’s beautiful and it is so honoring of who she was. That part of her that could always see the brokenness in others, and yet she never judged. She reached out to them, she made a difference. I can only hope that her life taught me to do the same. Stop sitting on the sidelines, Toni, and reach out. Wonderfully written, Doug. Dianne was, indeed, a rarity and our world is a lesser place without her. Heaven, however…heaven is richer for her presence. Can’t you just see her dancing with Jesus?? Thank you. In behalf of a number of broken people who give themselves away anyway and who will read this. Thank you. What a lovely soul you share with us. Thank you.